Set explicit, quantifiable and material goals and OKRs for business outcomes such as revenue target, market share gain, profit margin or other quantifiable result. Don’t confuse activity with outcomes and resist the temptation to set motion-based goals. (It’s not the number of swings that matter, but scoring more runs than the opponent.) Focus goal setting on end-state or end-point outcomes and make sure everyone on the team understands them. Create the one-page dashboard you will use to track progression against goals over the quarter – what are the key results and meters that matter? Define the streams of work and identify the key deliverables within each stream. Map the metrics from your dashboard to the workstreams. All the deliverables should be defined by the explicit outcome expected and a due date. Analyze the work plan to ensure that the deliverables and their outcomes do add up to the results needed! Every deliverable on the plan should be assigned to a single owner, and every member of the team should have clarity on how his or her deliverables impact goal achievement. Next, add measurement for deliverable completion to your dashboard. Now work the plan rigorously and relentlessly! Meet with staff members at the beginning of each week to review the week’s deliverables list, then ask for a status report on results against this list at the end of the week. This is the single most effective way to achieve the plan; working and reporting against the same list concentrates effort and action where they’re needed. The deliverables list and status report form the agenda of the following week’s one on one meeting and drive execution consistency and accountability. Use the status reports with weekly outcomes to update your dashboard. This higher cadence monitoring of plan vs actual will help you more quickly identify execution gaps that threaten goal achievement or where the plans need to be revised. Team members will have confidence they’re working on the right things and that their work matters. See what the team can achieve with a consistent, outcome-focused execution framework. P.S. WorkBoard is a great way to communicate OKRs, define workstreams, assign deliverables, and automate status reporting – you’ll have a structured execution model and real transparency with less effort from everyone. You can learn more here. 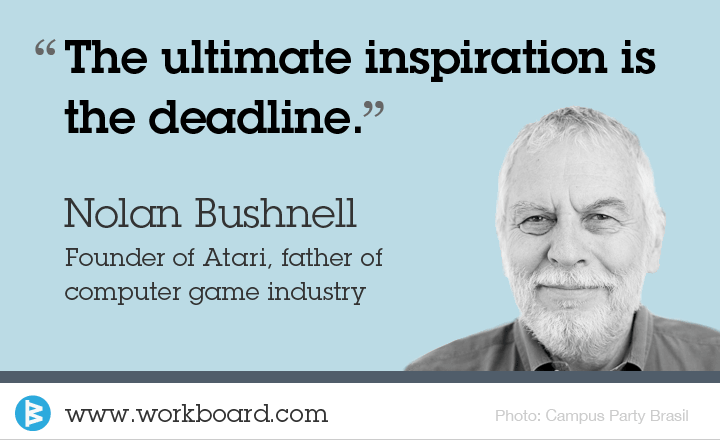 Nolan Bushnell founded Atari in 1972, launching the video and computer game industry and by 1982 reached $2 billion in sales. Its Pong game changed the distribution landscape across retail, entertainment and the computer industries. Newsweek named him one of "50 Men Who Changed America." He went on to found and lead many more companies, including Chuck E. Cheese and BrainRush, his current venture. He was featured in the film on Silicon Valley, Nothing Ventured, in 2011.